I have an addiction to Mexican food. Mexican-American. Tex-Mex. Authentic Mexican. Just about any recipe with that flavor profile is a home run for me. Is it the big bold flavors? 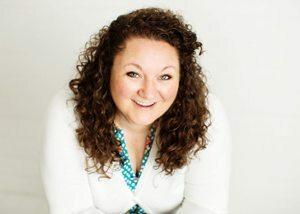 The passionate use of cheese? 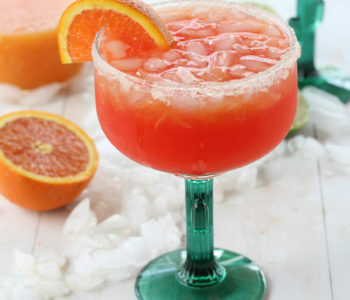 The bright and colorful ingredients? 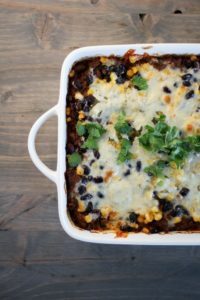 Salsa Chorizo Casserole captures all of these things I love. Did I just say “passionate use of cheese”? 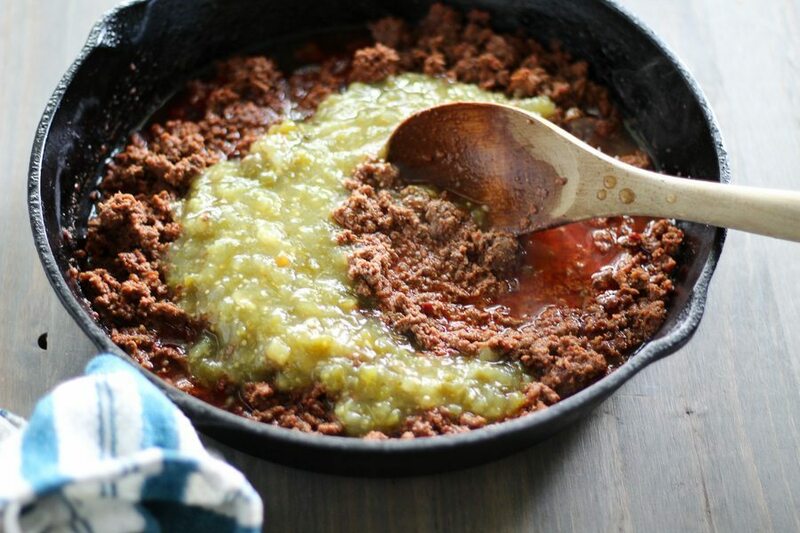 Warning…this recipe also includes the wanton use of salsa verde and chorizo. 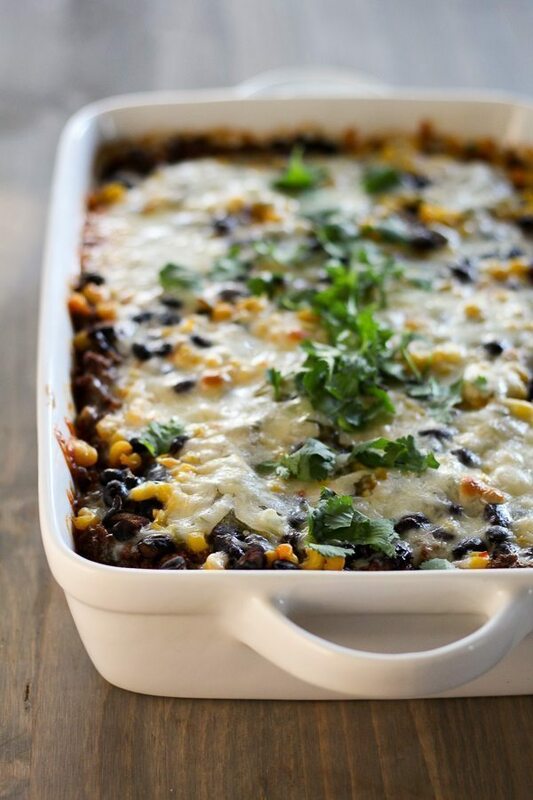 Salsa Chorizo Casserole is a flavor-packed casserole recipe you will go crazy for! Chorizo has this magic way of making a normal Mexican meal better. 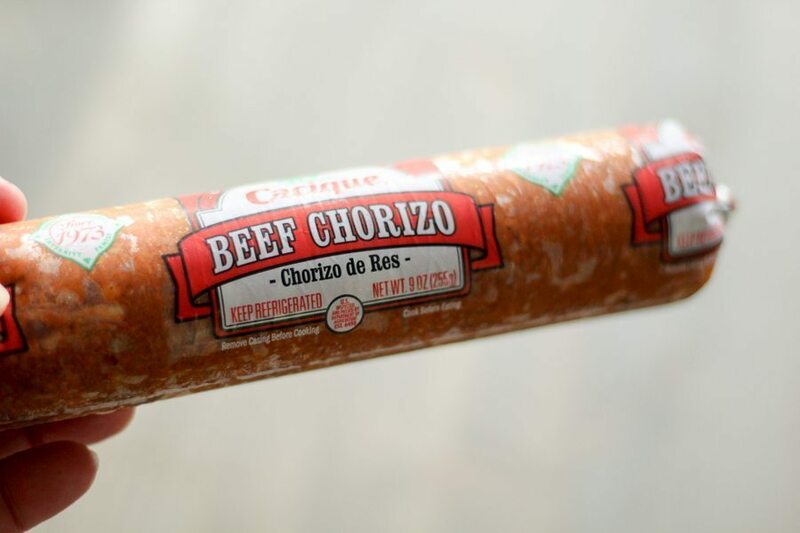 Take a recipe with a score of 7 on the yum chart…chorizo will bump it to a 10. Whether you use pork or beef chorizo, this spicy rich seasoned meat will provide another layer of flavor to your recipes. 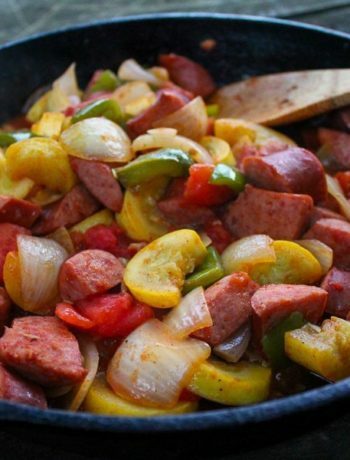 Using chorizo also takes a lot of the guesswork out of seasoning your meal. It is really heavily seasoned, and a little on the salty side. This recipe combination for Salsa Chorizo Casserole required no additional seasoning. That makes life easier, doesn’t it? 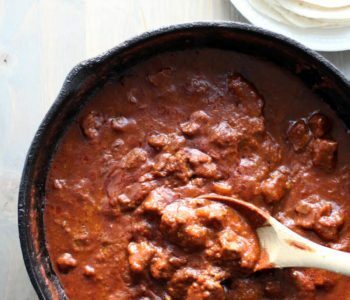 We have been walking on the spicy side lately…check out our Easy Chile Colorado Skillet Recipe. I love salsa verde. 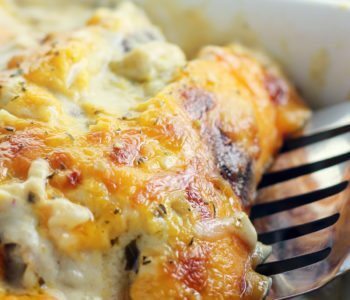 The bright and tangy flavor is so good with this casserole. 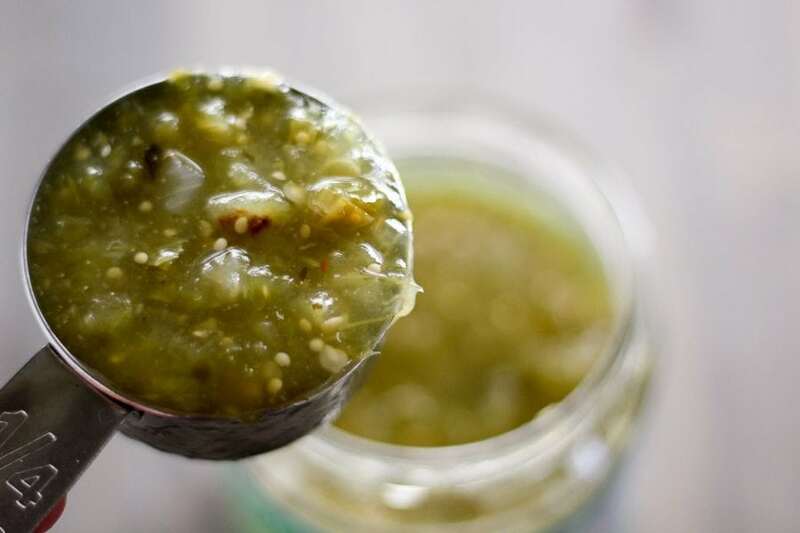 You can use your favorite jarred variety or make your own with fresh roasted tomatillos. 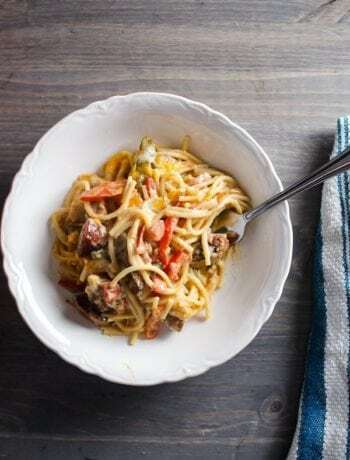 Since I was making this easy dinner recipe on a weeknight, I went for the easy store-bought version. 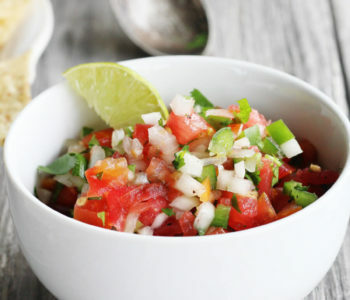 Definitely use a salsa that is thick and chunky. See how the chorizo spices have blended with the ground beef and a little bit of water to form a rich red sauce?? Genius ingredient! Now the fun part of cooking!! Making it your own. 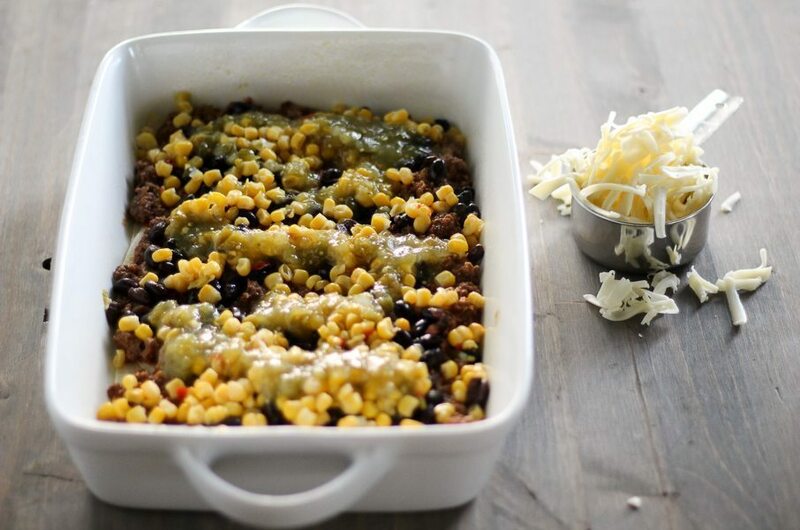 We layered our flour tortillas with the meat mixture, topped with black beans, Mexican corn, more salsa verde, and Monterrey jack cheese. Shameless use of salsa verde and cheese. 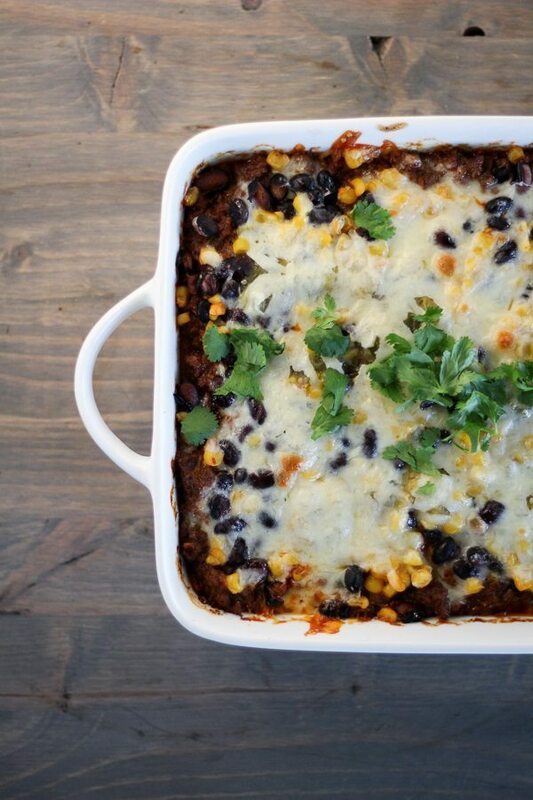 Repeat the layers: tortillas, chorizo mixture, beans, corn, salsa, cheese. Then into the oven to make it hot and bubbly. 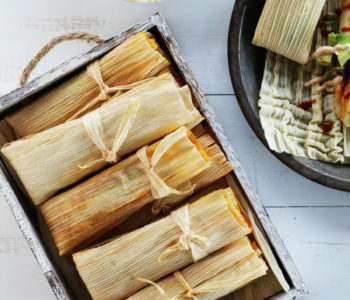 If you love Mexican food like we do, click here to get our Free Mexican Cookbook! Me? I couldn’t wait for later. Easy and cheesy, bold and full of familiar flavors…but with a little something special with salsa verde and chorizo. 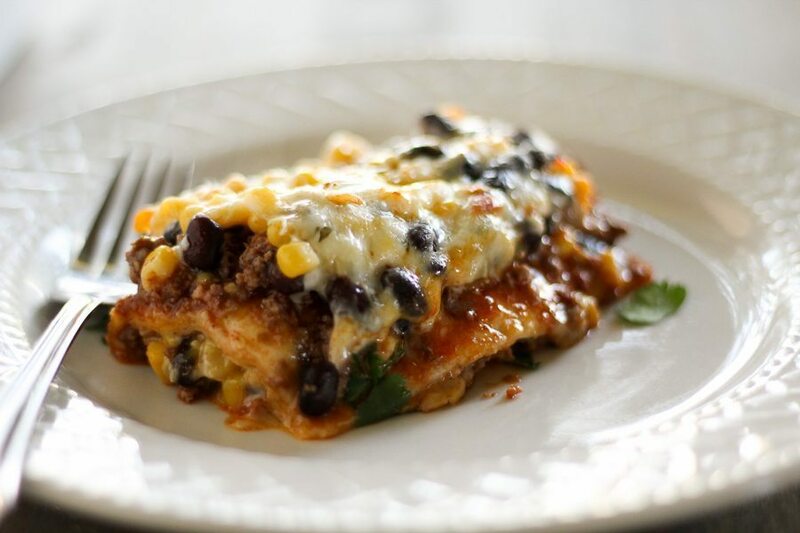 A spicy and savory casserole loaded with your favorite Mexican flavors. Preheat oven to 350 degrees. Spray a 9x12 casserole dish with non stick spray. Cook ground beef with the chorizo until browned. Stir in 1 cup of salsa and the water. Simmer for 10 minutes. 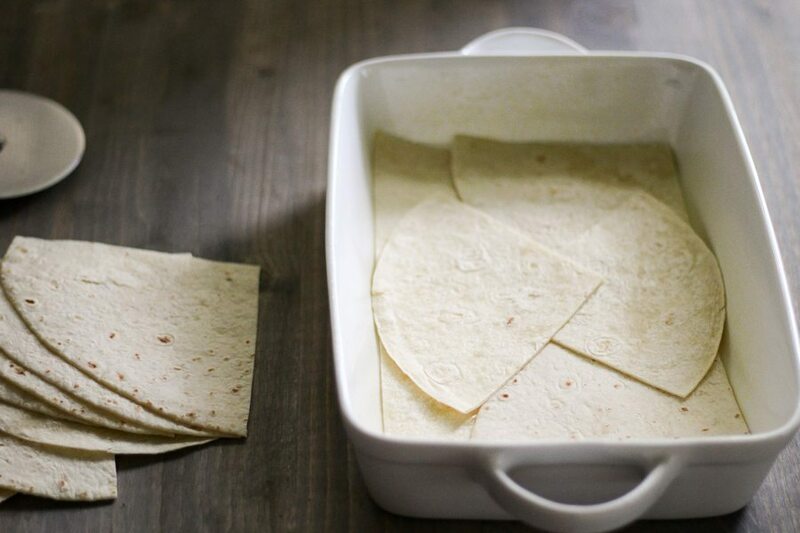 Cut flour tortillas into halves or quarters and create a layer in the bottom of the baking dish. Evenly spread half of the chorizo mixture. Top with half of the beans, half of the corn, and half of the remaining salsa. 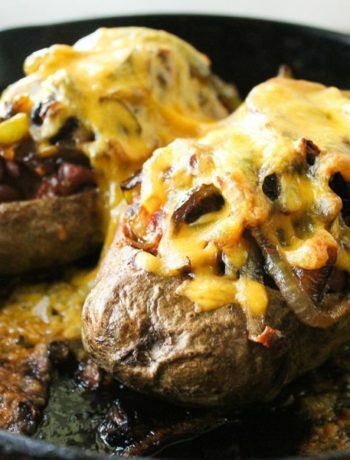 Sprinkle with half of the shredded cheese. 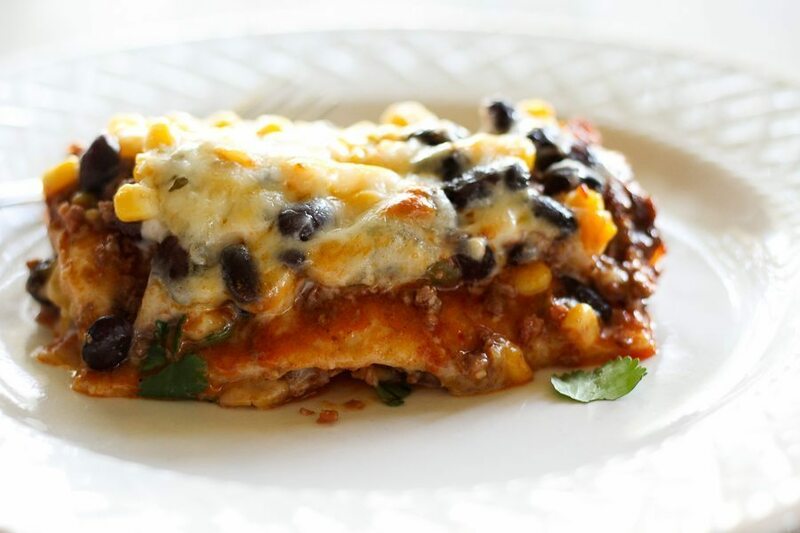 Repeat the layer: tortilla, meat mixture, beans, corn, salsa, cheese. Bake for 30 - 45 minutes until heated through and bubbly. Let stand 15 minutes before serving.